Important update: Meat The Butchers monthly subscriptions are currently unavailable. At the moment, the service exclusively fulfills one-time orders. If you are interested in subscribing, be sure to check back for updates. In the meantime, you can give the service a try by ordering commitment-free. Meat The Butchers is a California-based meat delivery service that has been around since 2016. The service was launched by The Premier Meat Company, a family-owned business that has been providing the highest-quality, sustainably sourced, hand-cut meat for over 50 years. Created with true carnivores in mind, Meat The Butchers exclusively offers premium meats and seafood of superior quality, flavor, freshness, and texture. If you are a meat lover who settles for nothing but the best, keep reading this Meat The Butchers review to learn more about this high-end online butcher shop. 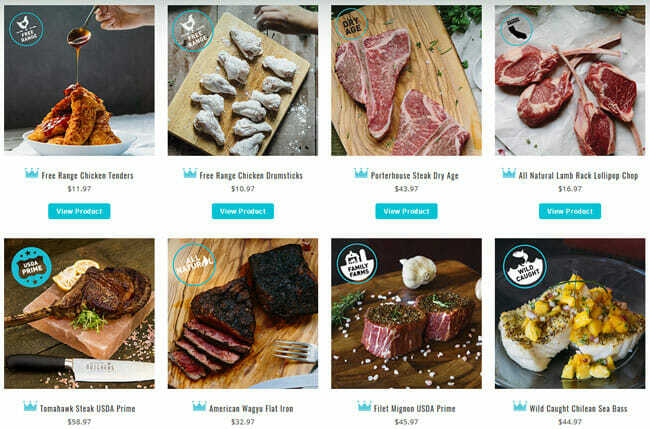 Meat The Butchers is your personal online butcher that can deliver top-quality meat to your doorstep anywhere in America. You can choose from two ordering methods – commitment-free, one-time orders and subscriptions. With one-time purchases, you can shop as often as you please, freely browse the online shop, choose the products you like, select the desired quantity, and proceed to checkout. You can either shop as a guest or create an account and enjoy various perks including monthly promo codes and monthly specials. If you want to receive premium meats regularly, you can opt for one of the 5 monthly subscriptions. The subscription options include The Premier Butchers Box, InstaMeat, What’s For Dinner, CAlifornian, and Burger Kit. As a subscriber, you get to choose the plan that works for you, decide how much fresh meat you want to receive every month, and customize your subscription to your liking. The subscriptions are highly flexible. There is no minimum subscription period. Every month, you get to decide whether you want to receive your monthly delivery. It is only important to remember that you should make changes to your subscription (modify, pause or cancel) by the 15th of the month in order for the changes to apply to the following month. Meat The Butchers stands apart as one of the rare meat delivery services that exclusively focus on premium meats. Its chicken is free-range, its beef, lamb, and pork are all-natural, mostly grass-fed, and grass-finished, and its seafood is wild caught. Not only is all the meat sustainably sourced and of the highest quality, it is also fresher than almost any other meat you can find. It is locally sourced from the best farms and arrives at your home just a few days after it is hand-cut. Shopping at Meat The Butchers is like getting your meat from a friend who owns a farm and sends you the best cuts at peak freshness. 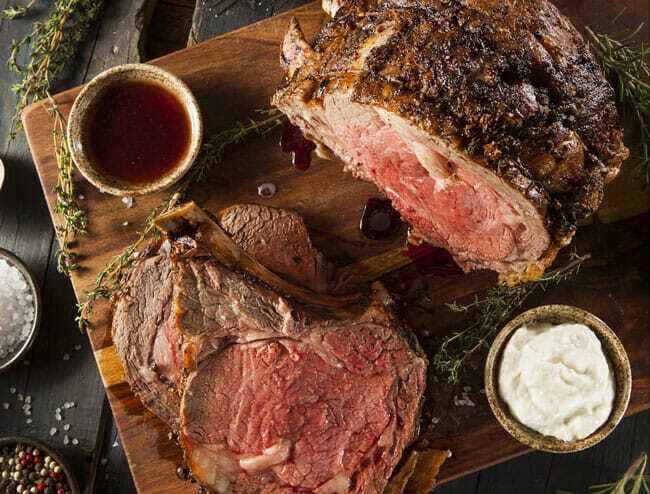 As the service is designed for epicurious carnivores, it offers everything necessary to perfectly prepare and thoroughly enjoy the cuts it provides. It offers a variety of salts, seasonings, rubs, marinades, glazes, and even smoking chips for the ultimate grilling experience. In addition to amazing meat, Meat The Butchers provides great rewards to anyone who becomes a registered member of its Butcher’s Club. By creating an account, you get exclusive access to monthly specials and promo codes. You also get to earn one reward point for every dollar you spend at the shop. You get a $1 reward for every 100 points. You can redeem the points for a $15, $25, and $50 credit you can use for future purchases or $15, $25, and $50 gift cards for Starbucks, Coffee Beans, Target, iTunes, Best Buy, Trader Joe’s, Whole Foods, and AMC. Speaking of gifts, Meat The Butchers offers great gift options for carnivorous foodies. You can purchase a gift card worth anywhere between $50 and $500 or get a gift subscription for a friend. Meat The Butchers offers over 70 different cuts of meat and always has at least half a dozen delicious seafood options. The products are neatly classified in accordance with meat type and you can choose from 5 different categories: Beef, Poultry, Seafood, Lamb, and Pork. The Beef section includes 100% vegetarian-fed USDA Prime beef, highly marbled Japanese Wagyu beef, grass-fed, grass-finished beef, and naturally dry aged beef that is aged for 28 days in order to achieve optimal tenderness and luxurious flavor. There are about a dozen of options to choose from and you can order steaks, roasts or items from additional selections, such as burger patties and tenderloin carpaccio. In the Poultry section, you can find chicken, quail, and turkey cuts. Unfortunately, quail and turkey are not available at all times, but there are always around 10 poultry items to choose from. As mentioned previously in this Meat The Butchers review, all poultry cuts are natural, free-range, and sustainably sourced. The Seafood section features all-natural, sushi-grade seafood. Usually, the selection includes ahi tuna filets, black cod, halibut filets, seabass filets, and specials like Scottish salmon premium block cut. All seafood is line-caught mere days before it reaches your home. The Pork section features about half a dozen items. You can choose from a variety of premium chops, roasts, and items from additional selections, such as all-natural applewood bacon, pork belly, and PMC Italian sausage. In the Lamb section, you can find 100% vegetarian-fed lamb. You can opt for lollipop chops, frenched lamb rack, T-bone chops, ground lamb, and more. Usually, there are about half a dozen lamb items. In addition to individual products, Meat The Butchers offers assorted packages for different occasions. You can purchase burger, grill or seafood packages, pick up a handy gift package or opt for seasonal specials like Valentine’s Day or Game Day bundles. Now, it is time to say a word or two about the company’s monthly subscriptions. As stated previously, there are 5 subscription types. The Premier Butchers Box allows you to enjoy regular deliveries of prime steak and dry aged steak. The InstaMeat subscription brings you both poultry and luxurious steaks suitable for grilling. The What’s For Dinner subscription is designed for adventurous foodies and includes a different selection of meat and seafood every month. The CAlifornian box is designed for fans of South Californian cuisine. Finally, the Burger Kit subscription allows you to enjoy a variety of burgers and sliders every month, including everything from dry aged beef to grass-fed chuck. Depending on your needs, your monthly deliveries can include 6 lbs. (16 portions), 8 lbs. (21 portions) or 12 lbs. (32 portions) of meat. All Meat The Butchers items are individually priced. The cuts usually come in 8 oz., 10 oz., 14 oz., 16 oz., 18 oz., 22 oz., 28 oz., 32 oz., 5 lb., and 8 lb. packs. The prices of individual items normally range from around $11 (8 oz. pack of prime rib burger patties) to about $75 (5 lb. pack of frenched pork rack ribs). The prices of assorted packages, seasonal specials, and subscriptions depend on meat type and quantity and normally range from around $78 to $157. Unfortunately, shipping is not free on all orders. The threshold for free shipping varies depending on location and ranges from $75 to $350. Meat The Butchers ships its products across the continental US. All orders are shipped via FedEx. Delivery options available depend on location and include Standard Overnight Shipping, Ground Overnight Delivery, Ground 3-5 Days, and Ground Express 2-4 Days. All orders are shipped fresh except in the case of Ground 3-5 Days and Ground Express 2-4 Days deliveries. Orders are shipped on Monday, Tuesday, Wednesday, and Thursday. To make sure Meat The Butchers meets all your standards and expectations, it is important to know its biggest advantages and disadvantages. With a short overview of its pros and cons, you can easily decide if Meat The Butchers is the right company for you. Meat The Butchers is an online butcher shop designed for people who do not mind paying a bit extra for the most luxurious meat cuts available in the country. It never comprises on quality, its meat is always fresh, and its assortment is more than rich. If you create an account, you can enjoy multiple benefits and save cash on your orders. Although the prices do not suit all depths of pocket, they are far from unreasonable. Since you can order without a subscription, you can opt for one-time orders on special occasions and treat yourself to some of the best meat you have ever tasted. Our ratings are the result of an objective and independent evaluation of Meat The Butchers, generating the final rating that reflects the overall quality of the company. Ratings may change as the service changes. Meat The Butchers customer rating based on 2 customer reviews. We found 0 verified Meat The Butchers discounts for April, 2019. There are no Meat The Butchers coupons or discounts right now. If you like Meat The Butchers but aren’t sure whether they are truly the ideal choice for you, you may want to take a look at our comparisons below to discover if one of their competitors is more suitable for you.